Welcome to our list of The Top 50 “Hottest” Tours In Canada. Click the right arrow on the slideshow below to begin! and you only get a handful of opportunities to make memories that will last a lifetime. With over 300 companies to choose from across Canada–all offering a variety of tours and adventures for locals and tourists alike. The choices can be overwhelming. That's why we've taken the liberty to create this valuable list of the top 50 tours in Canada. This is a list of the very best Canada has to offer to help take the guesswork out of your next booking. Whether you are an adventurer, a foodie, or just looking for a good time–you'll find a little something worth while here (budgets high and low). You can usually find travel deals to all the tour destinations listed at an affordable price. Our aim is to fill you with a very unique Canadian experience that will last you and your loved ones a lifetime. Professionally guided tours offer personalized service and participants interests are incorporated into the City, Capital Sites and Meet the Artist Gallery tours which range from 2-3 hours in length. Get outside the city limits with the Hiking Tour–where participants take a short hike to see Cameron Waterfalls. Enjoy boat sight-seeing tours on Great Slave Lake, as well as fishing for trout on trophy lake. Don’t miss the great northern pike and arctic grayling which are also available and can be combined with any other packages from June to September. My Backyard Tours also specializes in creating custom tours and offers step-on guide services. “Superb! What a fabulous team and day tour My Backyard Tours is! We did a day tour around Yellowknife with our guide. He was very accommodating and shared so much information about Yellowknife - it was interesting and fun to do. Margaret who runs the operations was so very helpful and caring and accommodating to our families needs during our stay. I highly recommend My Backyard Tours!" Get ready for the Adventure of a Lifetime! Whether you are a first time whale watcher or a seasoned veteran, it’s a guarantee that you will have a blast! Your tour will last a minimum of three hours and will include various stops at different points of interest. While on scene with whales and other marine wildlife, the vessel will be positioned parallel to the animals allowing for excellent photo opportunities. All the while, you will be fully entertained and educated by the industry’s best and brightest marine adventure guides. "WOW!!! Due to the fact the boat was pretty much empty it was more like a private tour. Very much worth the money. Saw not only orcas but other whales and wildlife. Victoria, British Columbia is one of the best places in the world for watching orca, humpback, gray whales and other species that live in the marine habitat. This city is perfectly situated directly in the middle of the southern resident killer whales seasonal feeding ground. Approximately 80 whales return each year to cooperatively feed on the abundant salmon that are returning to the rivers to spawn each fall in the area. It is also the world’s easiest place to watch killer whales in the summer. Eagle Wing Tours has a Whale Watching and Wild Life Tour that aims to satisfy the adventurer within you. For many guests Whale Watching is a life changing experience. Prepare yourself for the Whale Watching Adventure of a lifetime! “Lovely trip out to the ocean. Made the trip out to sea on the catamaran and had a fabulous afternoon. We saw many whales and other wildlife. The enthusiastic crew takes their time to explain and show you the whales. Its not a cheap tour, but worth every penny when the first whale breaches the horizon." Experience your own Arctic Adventure. The Tundra Buggy® Adventure offers the exclusive chance to travel into the Churchill Wildlife Management Area, one of the best locations in the world to view and photograph polar bears in the wild. A Tundra Buggy Adventure is the best and safest way to view the majestic polar bear in its natural environment. You will have the opportunity to explore the open tundra while your driver discusses the effects of tides, currents and ice formation on the polar bear. Adventures are year round, so follow the link below for more information on a tour that would work best for you! “UP CLOSE AND PERSONAL WITH POLAR BEARS!! If you are thinking about a journey of a lifetime. Consider Frontier's Tundra Buggy Lodge Adventures. I just came back from an 8 day tour. AND it was nothing short of amazing!! We saw many POLAR BEARS, Gyre falcons, Arctic HARE, and Arctic Fox and Ptarmigan! A must see! Staff were absolutely top notch, food was awesome and staying in the Buggy's was awesome! Can't rave enough about the Frontier's trip!" Experience a one day jet excursion from Calgary, Edmonton or Saskatoon to polar bear country in Churchill, Manitoba. Witness polar bears in their natural environment as they migrate toward the coast in anticipation of freeze-up and to access their favorite diet of ringed seals. A Tundra Buggy® will transfer you across the terrain, to view the polar bears in a comfortable and safe manner. "An Incredible Experience. Amazing doesn't begin to describe this trip. Seeing sixteen polar bears in one day, one so close that could almost reach out of the tundra buggy and touch it, was incredible. Classic Canadian Tours has organized a day that, while long, was well organized and first class. We felt invited and welcomed into the world of the polar bear. While the trip was expensive it was definitely worth it. My wife and I will never forget this day." In the Northwest Territories we specialize in unique journeys of mind, body and spirit, all year round. You're invited to share our spectacular world and all its wonders. There’s no better place to experience the power and mystery of the Aurora Borealis. The world’s greatest fish stories begin here in lakes that are among the planet’s biggest and cleanest. Paddling, rafting and cruising provide an up-close look at our epic land. Dozens of eager dog teams are waiting to whisk you over ice roads and along bush trails. And while in the Northwest Territories meet northern people and learn firsthand about Aboriginal cultures, uniquely vibrant in the northern world. Adventures include: Dogsledding, Aurora Day Trips, Boat/Canoe Rentals, Campgrounds and Cabins, Snowmobiling and more! Set sail with Newfoundland’s award winning boat tour through “The Narrows”, past Cabot Tower, en route to Cape Spear. Journey through pristine waters that are home to world’s largest concentration of humpback whales. Steam past 12,000 year old icebergs and watch as Atlantic puffins frolic along the coastlines. Discover a place where the Atlantic Ocean meets the edge of the earth while you explore and enjoy magnificent views. The two-hour narrated tour will enlighten and entertain you as you set sail on a true Newfoundland cultural adventure! "Would highly recommend this 2 hour boat tour of St John's Harbour, the Narrows, and Cape Spear for everyone! Tourists to our town and residents of NL will all love this tour. The staff, Captain Barry, Nick and Janice, were very knowledgeable and made sure everyone was taken care of. Best view of St. John's and Cape Spear which cannot be appreciated from land." Epic Rocky Mountain Heli Adventures. Embark on the most epic adventure in the Canadian Rocky Mountains with two locations to serve you. the Kananaskis Base offers helicopter tours for those wanting an epic view of the Rocky Mountains and easy access to the iconic sights of Banff National Park, Lake Louise, Moraine Lake, and deep into the backcountry from a super convenient location. Our experienced pilots will whisk you away over the Rocky Mountain peaks to experience unbelievable views, all packed in to a tour as short as only (the most incredible) 20 minutes of your life. The Icefields Adventure Base offers helicopter tours for those who like to venture off the beaten track and fully immerse themselves into the incredible sights and sounds of nature. Imagine the epic views as you soar right over Rocky Mountain peaks, getting a unique birds-eye view of glaciers, rivers, lakes, and waterfalls from a perspective that few are lucky enough to see. If you're interested in something even more unique, why not stop for a hike, a mountain top picnic, or bring a special someone to enjoy a private romantic tour you'll never forget. Something to add to your bucket list. The Great Canadian Adventure Company is the source for adventure travel vacations and holidays in Canada. They provide a complete travel booking service and have an extensive catalog of adventure tours, trips and destinations throughout Canada. Since 1997 The Great Canadian Adventure Company has served thousands of clients from all over Canada and around the world. Whether you’re an active adventurer, into fishing or just relaxing, there is something for everyone here. Plan your next great Canadian adventure with the information below, you won’t be dissappointed! This is a wonderful opportunity to focus on bear viewing in one of the most famous sites in Canada. Experience the crisp night air, the squeak of your footsteps on the hard packed snow and the magical northern lights in the Yukon. Enjoy the spectacular Aurora Borealis in the comfort of an exclusive and unique Northern Lights viewing facilities. They are built in the tradition of the historic wall tents, used by gold seekers and trappers one hundred years ago. A wood fired barrel stove keeps them at a comfortable temperature, while hot drinks and snacks provided by your guide will keep you warm from the inside. Live the Yukon adventure with Aurora Borealis and Northern Lights package tours and optional winter activities such as dog mushing, snowmobiling, snowshoeing, ice fishing, sightseeing flights and special events. ‘WOW, what an experience. We went on the single night tours for three nights in a row in mid December and saw the lights two out of three times. We even managed to see snow and the northern lights at the same time, apparently this is quite rare. The staff on the tour were amazing, especially Rika, Atsushi and Toshi. They were all friendly, informative and eager to share their aurora experience with us. Once at the tour site, there were snacks, drinks and tripods and warm shelters provided. Try and avoid using the toilet when it's -27 outside, it's not something you want to experience." A brilliant green wisp uncurls slowly across the night sky. The apparition is soon joined by others to become a pulsating chorus of multi-coloured light, waving, melting away, regrouping. You’re not hallucinating. You’re witnessing one of the most surreal natural phenomena on earth: the aurora borealis. Unravel the mystery to discover what makes the night sky blaze with colour. Learn the tricks you’ll need to photograph these fleeting images. Optimal viewing is September through April, when solar activity is highest, from just about anywhere away from urban light pollution, particularly our dark sky preserves. See countless constellations, the planets, and the backbone of the Milky Way, all visible with the naked eye. Use telescopes to see fine details like the rings of Saturn and faraway galaxies. It’s literally out of this world. And watch for those northern lights. Travel Alberta offers a variety things to see and do, checkout the link below to learn more! "After an amazing display of Aurora at its best, my wife now gets why people brag about seeing the Northern Lights." A variety of professionally guided sightseeing tours from the following amazing sightseeing destinations: Vancouver, Victoria, Whistler, North Shore and Sea To Sky. Real Life is stressful enough, so the purpose is clear: Provide stress-free exploration with unparalleled expertise and local knowledge leaving everyone feeling entertained, rested, and full of fun facts. Amazing guides with lots of personality–extensively trained to create a truly authentic service, a masterpiece of the trade which results in a richer experience for all. "She made a point of learning the names of all passengers on her bus and from where they were from. She addressed each person by name throughout the day. Quite a feat! Her enthusiasm was remarkable." Explore the streets of Vancouver with a local guide who’s sure to knock your socks off. 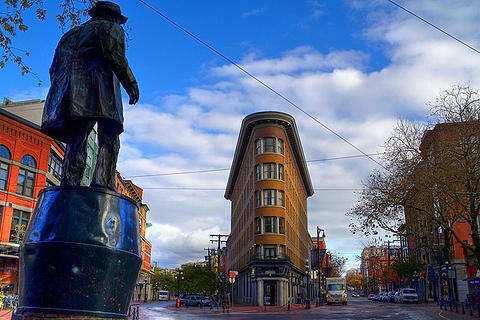 Gastown is where the city of Vancouver began, and where some of our more “colourful” history exists. Meet some of the interesting characters that have helped shape the city, walk the cobblestone roads, get a picture with the famous Steam Clock and get insider tips on where to eat and drink on the cheap. Starting near the Vancouver Art Gallery, this fun, interactive tour moves North along Granville Street to introduce you to the history of neon signs in the entertainment district, visits the site of one of Vancouver’s biggest protests, introduces you to our railroad history and takes you for a stroll down historic Gaolers Mews. On this easy-walking tour we give a complete overview of downtown Vancouver and venture into some of the city’s historic buildings. Our unique style of combining history with pure entertainment, stories & jokes has made us one of the most popular walking tour companies in Canada! "One of the best things we did in Vancouver. We did the 'Chinatown & East' tour. Our guide, Jessica, was extremely knowledgeable & interesting. Highly recommended!" A tour like no other. Nothing against snapping a selfie with your iPhone, but on LiveToronto's Private Walking Tour, you'll get enviable pics (without your arm) for posting on Facebook or printing in a photo book. Depending on your interests (sports, architecture, music, etc. ), your personal photographer will plan a walking route to hit Toronto's key sites and set up photo ops. As you explore downtown's icons and hidden gems, your photographer guide will share interesting details about each landmark while capturing everything from classic poses to silly shots. “I don't think I could recommend this tour enough. It was an excellent way to get acquainted with Toronto. This tour is definitely worth and the time and investment!" Simply put, it's the best! Toronto’s most comprehensive tour at the lowest price around. Whether you’re in Toronto for a couple of hours or for a few days, there is a perfect tour for you. Since 1993, Niagara Toronto Tours Daily bus tours has delighted over 20,000+ passengers with a tour to Niagara Falls–winning several Toronto Tourism Awards along the way. Enjoy a spectacular full day experience in Niagara at a very affordable price. A tour guide can 'make or break' your day. That is why Niagara & Toronto Tours carries only a select few driver/guides expertly trained & licensed to ensure a memorable and entertaining day for you and your party that won't soon be forgotten! “Fantastic day out. Having considered a number of options to visit the Niagara Falls I am really glad i chose this provider. The initial on line booking and the personal follow up made me feel like my business was important to this company." Discover one of Toronto's most historical and trendy areas by one of the coolest modes of transportation -- a Segway! Take a 30-minute guided tour of the Distillery Historic District and explore its revived Victorian-era industrial buildings and modern sculptures, boutique shops and cafés. Your professional, knowledgeable guide will share interesting facts and stories about this neighborhood as you cruise around the area in style. "This tour was awesome, mostly because of the tour guides. They made the history aspect fun and riding the segways easy! I would recommend this to anyone. Money well spent!" After Six years of waiting, River Valley Adventure Co. has arrived in Calgary! Located in beautiful Sien Lok Park. Glide down the pathways of our Guided Segway Tours through Calgary. With over nine years experience in the Segway business you will be in good hands. The guides are rated as the top Segway trainers in Canada. They strive to ensure your experience safe, fun, and extremely memorable. “What a fun, unique way to see the City’s river front! Our tour guide David was charming, funny and informative. We have never been on a Segway before, and it was so much fun! The tour was an excellent way to see the updated river front pathway, the new East Village, and new St Patrick's Island Park. The instructions at the first portion of the tour put us at ease, and allowed us to have fun the entire time." This exciting Segway tour showcases the beautiful Edmonton River Valley and Sien Lok Park in Calgary, as you effortlessly glide through the park on an amazing segway. Tours in both locations run all year long giving you the ability to enjoy the blooming spring buds, breathtaking lush summer greenery, colorful fall foliage or a winter wonderland! On this tour you will receive in-depth training, from a certified Segway trainer. They will go over the skill and drills for everything you need to know before heading out on your adventure. After training get ready for the experience of a lifetime, a ride through Edmonton’s world famous river valley or Calgary's beautiful Sien Lok Park. You’ll have the chance to enjoy the beautiful scenery like you never have before. Whether you are looking for something to do with the entire family or for a fun date idea, don’t miss out on the Segway Adventure Tours from River Valley Adventure Co.
“Amazing Tour & Guide! My husband and I were the only two who booked a time slot and we had an amazing experience with the tour guide! The weather was beautiful and the trails were fairly well maintained! The tour guide will gauge how well you handle machine and keep you comfortable during the ride!" Montreal Walking Tours: These unique urban walking tours are designed to let you experience the city up close – whether food sampling your way up The Main, or admiring the architecture of the Plateau, the tours are sure to spark your senses! Some of the tours include: Old Montreal through the back door, Autumn walk on the mountain, Walk the brewpubs and more! The circuit includes the interior visit of Notre-Dame Basilica, goes across the historical borough from place d’Armes to place Jacques-Cartier through Notre-Dame and Saint-Paul Streets, and ends at Place Royale. "A great way to see old Montreal. We lucked out. Christian was our guide: knowledgeable and friendly and a very good narrator of history and architecture." Experience Calgary one step at a time. Every building tells a story. Calgary’s downtown core spins a yarn of a brash frontier town that has grown into a lively urban center where you can literally stand with one foot in the past and one in the present – and follow a “ribbon of steel” through the heart of the city. As you explore Stephen Avenue Mall and the Bow River Pathway, you’ll have an on-the-ground experience that Google Earth could never deliver. You’ll find out where Calgarians go for fine food and dining. You may hear the echoes of history at the site of an 1880s saw mill and the location of the 1988 Winter Olympics awards ceremonies – and perhaps modern day music from the Folk Fest held on Prince’s Island Park. The walk is at a comfortable pace and the group makes several stops, including bathroom breaks as needed. The “Kensington Krawl” food tour, will give you the opportunity to enjoy select tastings in the market from a cheese shop, bakery, butcher shop, spice shop, and more. You will meet with local merchants and shopkeepers whenever possible during your excursion and your guide will offer you a background on the history and heritage of this vibrant neighbourhood, with memorable stories and anecdotes. You will discover why Kensington Market is truly a one-of-a-kind place! “Amazing experience through gastronomy and History of Toronto! Suzanne is a friendly and qualified guide, which makes unique the experience through Kesington Market... Specially for who is looking for a different and special way to getting know Toronto and its multicultural faces!" The Old Toronto Beer Tour is the original all-day Saturday beer tour that explores the culture and history of Toronto against the backdrop of our rich brewing heritage, both past and present. It is a truly unique way to see Toronto, enjoy some fabulous Lagers and Ales and meet new like-minded friends along the way! This is an all-inclusive full-day travel experience, with visits to 4 of Toronto's craft breweries, Steam Whistle, Amsterdam, Mill Street and Izumi Sake Breweries as well as Fort York, Corktown and the historic Distillery District. Tutored tastings, all beer, a charcuterie lunch, transportation, and sight-seeing are included and it is fully guided by our fun and knowledgeable hosts. Add on an optional Beer Lover's Dinner at the Granite Brewery Restaurant to round out the day's festivities. “Worth it. Do yourself a favour and spring for this tour if you love beer and company. Very interesting and would have loved to go again while I was in town"
Your culinary adventure starts here. Toronto is the world's "new food destination” and The Culinary Adventure delivers. Since, 2010, this company has worked hard to become Toronto's + Canada's "Best Rated" Culinary Adventure company - embark on an award winning culinary experience that fits everyone's palate. Whether visiting Toronto for the first time or looking for a unique gift or special occasion, this tour is a must! It’s the only culinary experience company led by real food professionals. "Overall a really great experience! Kevin was very personable and knowledgable. Would recommend to locals and tourists. Probably ate the best gyros I've ever had!" Visit two wineries in NB with Uncorked Tours. Your first stop is Mott's Landing Vineyard in Cambridge-Narrows, followed by Gillis of Belleisle Winery in Springfield. In addition to these tastings, you will get to enjoy a sampling of NB cheese at one of the wineries. Return to Saint John knowing that you've truly experienced the legendary hospitality of the Maritimes. Tour includes: Return transportation from Saint John area hotels, a fun and knowledgeable tour guide, winery tour and tastings, cheese sampling, bottled water. This is not your average small-bites, sampling tour. Think of it as a progressive dinner where guests dine their way through the historic Gastown district, Vancouver’s most vibrant restaurant scene and Canada’s cocktail capitol. The adventure starts at a stylish brew pub for a local beer tasting with food pairing. With a stop at a lavish craft cocktail bar with old-world charms. Next you take a stroll through the neighbourhood and become acquainted with the hottest restaurants and historical landmarks to learn about the quarter’s legends and secrets. Finally enter the pebble stone back alley, a hidden gem away from tourists where guests enjoy 3 BC wines alongside local farm charcuterie and cheeses from an ever-changing menu. Expect award-winning restaurants, inventive dishes, eccentric personalities, and inspiring decor. "Amazing experience, great food, fun night and a fantastic hostess!!!" Bringing the best of the Canadian Rockies to you. Since 1997, SunDog Tour Co. has been providing first class transportation, tours, and activities to visitors of Western Canada. Discover the rugged beauty of the Canadian Rockies and Jasper National Park. The team is driven by exciting adventures and love to introduce guests to the region’s majestic alpine landscapes, glacier-fed rivers, abundant wildlife and beauty in all seasons. They will ensure your visit is unforgettable! “Discover Jasper & wildlife. Absolutely loved the discover tour! David was so informative and hilarious. Kept us all entertained and knew so much about everything, he also recommend that we do the ice walk tour and we highly recommend that too. We spent 3+ hours walking on ice, through caves and explored the most amazing country Jasper has to offer." Explore Rockies Sightseeing Tours. If roaring waterfalls, emerald lakes, alpine meadows and snowcapped peaks are on the list of things to do, then a sightseeing tour with Brewster’s Explore Rockies is a must. The activities, attractions and sightseeing tours take guests to the most exceptional locations for photos, wildlife viewing, and nature walks. Learn about the fascinating natural and human history of Banff National Park in the Canadian Rockies from local driver guide experts. Experience activities and tours on a luxury motor coach equipped with large viewing windows for optimal viewing opportunities. Enjoy the comfort of a Brewster Travel Canada sightseeing tour in the majestic Canadian Rockies. Brewster Sightseeing tours include convenient pick-up at most hotels in Banff. Banff is full of winter magic and has plenty of things to do in the winter. Your chance to icewalk, snowshoe, drive a dogsled, ride a sleigh, and see wildlife start here. In the Summer–be it sightseeing tours, wildlife viewing or whitewater rafting, Discover Banff Tours makes your visit to Banff National Park an adventure of a lifetime. Check the full list of things to do in Banff on their website below. “Discover Banff & Wildlife. Jordan was great! Knew so much and was not at all boring. Showed us everything Banff has to offer and its true beauty! It was such a great tour to start the day. I highly recommend this tour to everyone it was just absolutely amazing." Snowy Owl Sled Dog Tours, the famous forerunners in sled dog touring and racing in the Bow Valley, created the first dog sledding tours over a quarter of a century ago. With over 30 years of experience and expertise in touring, racing and conservation; they are extremely proud of their Canadian and Albertan roots and look forward to sharing their exceptional experiences with you! Snowy Owl Tours employs the most qualified instructors, the friendliest and most beautiful, authentic touring huskies who all receive the best possible dog care. A “Five Star” company in the business of making memories, they go the extra mile to ensure that their claims match the spectacular luxuries found within your experience! “Sledding with the Huskies! Wow. It was incredible! The dogs are beautiful. It is worth doing this tour! Make sure you have extremely warm gloves and socks/shoes! Hand warmers recommend!" Join the World’s Next Great Safari™ and take a walk on the wild side deep in the heart of polar bear country! Meet polar bears face-to-face and swim with beluga whales, all while enjoying world-class service, accommodations and cuisine from the comfort of the only fly-in Polar Bear Eco-Lodges on the planet. Churchill Wild specializes in ground-level walking tours through the polar bear inhabited regions of Arctic Canada. With a 100% success rate in every season, due to the wildly exclusive locations. You are guaranteed a life changing experience. A place where traditional Aboriginal culture blends together with modern amenities for a truly remarkable experience discovering the mystery of the aurora borealis. We are the aurora-viewing destination of choice in Yellowknife, Canada, providing the utmost in comfort and absolute beauty. Have a stress-free northern lights holiday. It’s a simple beauty, but a powerful one. As great streams of light cascade across the sky, you want to be able to relax and take it all in with complete services provided for you. Arora Village takes care of everything so all you have to do is choose from all of the tour offerings which include: Aurora Viewing Tours, Winter Experience Tours, Summer/Fall Tours and City Tours. There is something for everyone, year round, so please visit the site below to learn more! "Unique experience of a lifetime. We travelled for almost 30 hours to Yellowknife just to see aurora borealis. We were greeted with warm and cloudy wather but patience paid off. We were rewarded with a fantastic clear aurora night. Thank you to our guide Katrina for helping everyone and being a fantastic English guide." A true outdoors expereince in one of Ontario's most beautiful areas, Southern Georgian Bay. Escape the crowds and enjoy a sensational day rock climbing, caving or kayaking (summer) or take a stab at snowshoeing in the winter. The expert guides outfit you and teach you the skills you need to take on many of the available activities with confidence. Whether your interest be on the water or on land there is something for the adventurer in you! All our programs take place in the picturesque Georgian Bay area surrounding Collingwood, Ontario. Voyage past sunning seals, lighthouses and beautiful landscapes to the playground of the porpoise and majestic whales of the Bay of Fundy. An experienced crew and a unique ship–which includes washrooms, a heated lounge, food and a bar. “Had a great day. Our family had an awesome time back in early July. Friendly and knowledgeable staff. One of the highlights of our trip out east. Would recommend in a second." The incredible kayak adventures here are for everyone. No experience required. The trips are designed to cater to all levels of experience and abilities. The majority of people who join the tour are first time kayakers, Spirit of the West Adventures takes care to introduce you to the sport in a fun and safe manner. Be prepared for Wildlife Viewing. The incredible diversity of wildlife never ceases to amaze. From the smallest creature living in the rocks on shore, to the incredible diversity of bird life, deer, bears, dolphins, porpoise and whales. There are so many incredible species to see in this beautiful area. The philosophy is to not interrupt the natural behaviour of the wildlife. Spirit of the West Adventures considers it an extreme priviledge to view these animals in their natural habitat and to catch a glimpse into their daily lives and behaviours. "It was a great trip, I loved it... The entire trip was well planned and everything was well organized - Great guide - beautiful locations - My best trip ever - all over awesome blast of a trip." With 650 km of bike paths, Montreal offers a unique biking experience. Take advantage of various guided bike tours to discover the city’s main attractions and the most unusual locations. Carol Montreal on Wheels guided bike tours enable you to discover the city while enjoying gourmet stops. Creative tours designed by professional certified guides who take care to include in their itineraries surprising and unusual sites, will leave you more than satisfied. Let local experts enable you to discover urban Montreal in their own way! "Fun way to spend the morning. My husband and I recently visited Montreal. We were looking for a unique and fun way to see the city. We did the Montreal Plus tour and had a wonderful time! What a neat way to see the city. Definitely would recommend this to anyone visiting the city." Explore Toronto by bike. Fun and memorable city sightseeing tours of Toronto. Ride through Toronto’s neighbourhoods, parks, and iconic sites. Soak up the experience of Toronto’s history, culture, people and food. Bike safely and at an easy pace with expert local guides that will guide and educate you throughout the tour. Tours include everything you need including: use of a bicycle, helmet, water and snacks. Exploring Vancouver by bike is amazing – with generous bike paths and a relaxed biking culture. Experience the sights, sounds, and smells of the city, with tours led by story-teller guides to increase opportunity for learning and local insight. The most popular tour highlights the best of Vancouver food, history, ecology and culture. Highlights include seawall and rainforest touring in Stanley Park, lunch (on your own) at Granville Island Public Market, Olympic Village and historic Chinatown and Gastown. “I’ve been to Vancouver 3 times before but never seen such a sampling of the city’s culture, tastes, sights, and history." Forever serving up captivating new activities. The Old Port of Montreal is one of the most popular tourist attraction in the country with more than 50 activities and 6 millions visitors every year! “Good place to visit. I went there during day time around Christmas. I liked the place which reminds history. I went there with my wife during my Montreal trip." With the journey to Victoria equally as fascinating as the city itself, this tour offers scenic ocean travel, a captivating series of gardens, and an introduction to the enchanting waterfront city of Victoria. Packed with ever-changing experiences of the Pacific Coast and Vancouver Island, this tour is a must-do for those who have not yet visited Victoria! The city of Victoria boasts many impressive architectural wonders, including the iconic Parliament Buildings and the waterfront Fairmont Empress Hotel. Visit the unique shops and cafes of Government Street and Chinatown. Stroll along the Inner Harbor for prime ocean views, and enjoy some free time to take in this culturally significant city. Return on the bus to Vancouver by ferry to conclude this diverse tour. "Picked up on time. Ferry good. Tour guide and driver were excellent! Butchart gardens beautiful. Ice cream in the Italian Garden to die for! Blue fish Red fish Restaurant on the shore lived up to the guides' recommendation. Halibut/Salmon and chips. A long day but worth it. Relaxed." The best first thing to do in Winnipeg! For over six thousand years, people have been living at the confluence of the Red and Assiniboine rivers. Hop aboard the Winnipeg Trolley Company’s Heart of a Nation City Tour, and you will never see this community—today called Winnipeg—in the same way again! Visit the charming French quarter, St. Boniface, and the Exchange District National Historic Site, a popular filming location for a number of major motion pictures. See the MTS Centre, home of the NHL’s Winnipeg Jets, and the community club where music legends The Guess Who and Neil Young got their start. Enjoy the grandeur of the 400-acre Assiniboine Park, marvel at the world’s only human rights museum, and hear the story of one of Canada’s most mysterious architectural wonders, the Manitoba Legislative Building. For 95 minutes, you will experience the very best sights and stories Winnipeg has to offer. Learn why it was once called the ‘wickedest city in Canada’, how a local team became the world’s first Olympic hockey champions, the shocking connection to the world’s most famous spy—James Bond—and much more. This tour is humorous, engaging, and as the ‘best first thing to do in Winnipeg’ will help you discover what makes the city at the heart of the country so special! Ontario's leading motor coach & tour operator! Great Canadian Holidays Escorted motor coach tours, coach & cruise tours and fly & drive tours are innovative, economical worry-free and best of all...fun! Everything is taken care of, and travelling with family and friends has never been easier. Checkout the featured one and multi-day tours available in the link below. First-class luxury coaches can also be rented by groups and organizations across Southern Ontario, including Buffalo and Detroit. These award-winning coaches boast the finest amenities available, and feature stunning hand-painted and vinyl graphics dedicated to Canadian unity and pride. "We had a wonderful time. Lots of great pics and plenty of stories. Truly a once in a lifetime experience." An award winning attraction that blends history and entertainment into a presentation of two diverse periods in Canadian history. Get ready to be taken on a journey and become part of history. The Tunnels of Moose Jaw is a year-round attraction that provides guests with History and excitement. The stories of tunnels under Moose Jaw come alive in two interactive theatrical tours. Guests become part of the underground experience, travelling beneath the streets of Moose Jaw. History has never been more exciting. Walk by the side of the early Chinese immigrant then lay low with the infamous Al “Scarface” Capone. Each 50-Mintue tour features state of the art animatronics characters, a multi-media presentation, fabulous spaces, character tour guides and intimate group sizes. Relive Moose Jaw’s storied past. With over 40 years of guiding experience, specializing in small group adventures, the mission is to provide innovative, eco-friendly avenues to showcase the beautiful outdoors in the Thompson Shuswap Okanagan region of BC. Shuswap Unique Adventure Tours offers unique and thrilling adventures, suitable for first timers and return guests alike. You can expect qualified staff and a small guide to client ratio which is paramount to creating the professional, friendly environment that has satisfied many adventurers. The current focus on Segway tours is a perfect avenue for what the company believes in. With zero emissions, and minimal energy use to charge daily, everybody wins! “A must do! We did the 3hr river tour and loved it. Barbara was lovely with a great mix of humour and pointing out things of interest. Thoroughly recommend!!" From wonderfully scenic to downright dirty, partake in every level of ATV enjoyment. Whether you are a beginner wanting an easy ride or an expert looking for a challenge, or you classify yourself somewhere in between, Okanagan ATV Tours offers you a wide variety of great trails, great scenery, and great fun!!! Partake in either: Two-hour ATV tours, Four-hour ATV tours or Eight-hour ATV tours. Great for a corporate function, family outing, birthday party, or simply a friendly get-together. Enjoy the great outdoors in the beautiful Okanagan Valley with Okanagan ATV Tours! "On behalf of Edmond, Dylan, Bernard and Emilyn (the little ewok), we thank you for the thrill of a life time. For me, it ranks up there with bungee jumping, white water rafting, jet boating and swimming with dolphins. We're moving to Vancouver for good next year, so chances of seeing you both again is high, yeah!" Open seasonally from mid-May to mid-October, the Hopewell Rocks is located along the coast of the Bay of Fundy, which is home to the world’s highest tides. It is a self-directed park, however interpretive staff are located at key areas to answer any questions you may have. In addition to the opportunity to walk on the ocean’s floor, there are two sandy beach areas at either end of the park and a number of well-marked walking trails. The Hopewell Rocks is a magical place for your imagination to play…the only place where you can become a part of that story. “Walk on the ocean floor. Great time at Hopewell rocks. Walk on the ocean floor and see the way the tides have shaped the rock in this area over the years. Never fails to impress!" First Class Family Adventure, Excellent Value! Tour Tofino’s wild side with West Coast Aquatic Safaris. Enjoy the West Coast of Vancouver Island’s premiere wildlife and sightseeing. Get off the beaten path and experience eco-tourism that is environmentally responsible, safe, and fun for the whole family. See why whale watching in Tofino truly is special, take a bear watching trip from the safety of a boat, visit local Tofino hot springs, and don’t forget to checkout the seasonal safaris! “Excellent hot springs tour. We loved the hot springs tour. Knowledgeable and entertaining crew and we saw some great wildlife on the way back to Tofino!" The guided day tours at Tofino Sea Kayaking provide exceptional excursions through some of the most beautiful backdrops on earth. Create a unique and authentic west coast experience by choosing one of the guided tours that will take you on an incredible journey from the awe-inspiring inlets, islands & coastlines of Clayoquot Sound to the incredible ancient cedars of Meares Island. “Great start to the day. We had never been in a sea kayak before. Our guide was great, very knowledgeable about the area and the history. Put us both at ease for the crossing to Meares Island. Lovely walk in the forest on the island. Extremely peaceful and beautiful. We felt lucky as we did it out of season, the weather was great and we were the only two on the tour!! Spotted an otter and a few eagles plus an osprey."